Is the case for the bulls improving? Today I want to have that discussion, relative to emerging markets and the S&P 500. First off, it’s important to know that when money managers are bullish and positioning themselves for higher stock prices, they tend to invest in more speculative, higher beta names. And when portfolio managers position themselves for lower stock prices, emerging markets get killed, particularly relative to developed markets. 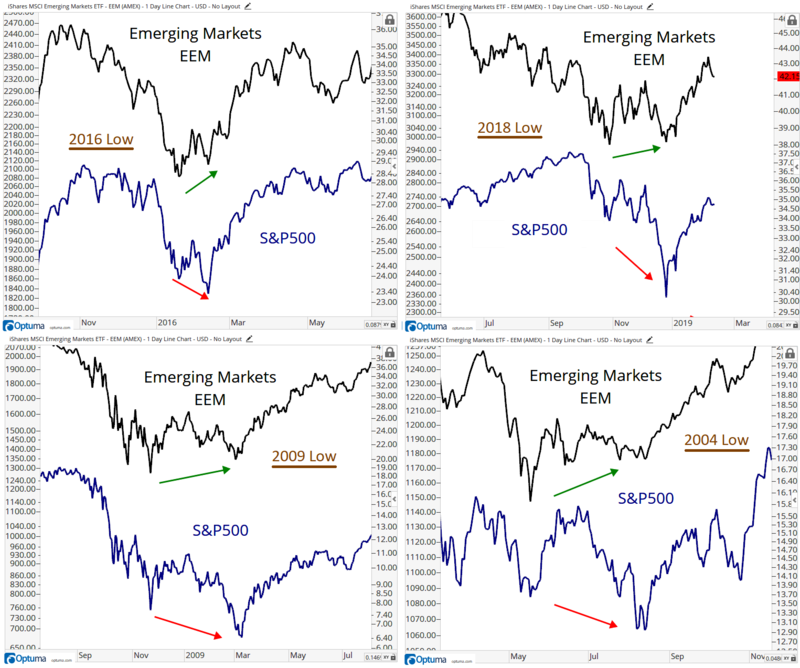 The four charts I’m showing today represent divergences between emerging markets and the S&P 500 over the past couple of decades. 2004. 2009. 2016. And today. When the S&P 500 is making lower lows but emerging markets are simultaneously making higher lows, it’s been evidence of risk appetite for stocks. Markets have continued to rally for years after the divergence. The question: Is this time different? My argument is no, this time is not different. It’s actually part of our bullish case for stocks. From the 2004 low, the S&P 500 rallied for over three years. From the 2009 low, the S&P 500 rallied for over two years, before continuing for another four. From the 2016 low, the S&P 500 rallied for two more years. I think the bigger point here is that when emerging markets have diverged positively in the past vs. the S&P 500, it has been evidence of risk appetite from a longer-term perspective. These are NOT tiny rallies lasting a month or two. They last years. Another counter-argument is that we only have a sample size of three here and I really hate tiny sample sizes. But, again, I think the bigger point is that it is evidence of risk appetite, not risk aversion. That’s what I’m trying to get at. This is just one data point and we never want to make decisions off just one, or two or even 10. We want to, of course, weigh all of the evidence and approach the market accordingly. By our work, this is evidence of risk appetite for stocks and is just one more thing to add to the bullish stance we’ve had all year — and why I’ve recommended individual long positions lately. If you’re not a Breakout Profits subscriber yet, now’s a great time to join. The last five trades we’ve put on in 2019 are all above their buy levels right now.